The 5-star Side Premium Hotel is an all-inclusive, family friendly hotel set on 18,000 square metres of lush grounds in a lovely private beachfront in Side. 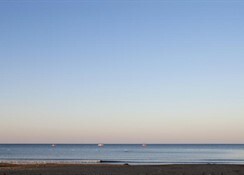 Just 200 m from the beach, the hotel offers an indoor pool and extensive spa facilities in the toasty Mediterranean climate. With modern architecture, spacious well-appointed rooms having attached balconies, and outdoor swimming pools, the hotel invites guests to rest amidst modern amenities and warm hospitality. The rooms come with minibar, flat-screen satellite TV, safety deposit box and a seating area and offers gorgeous views of the beach and surroundings. 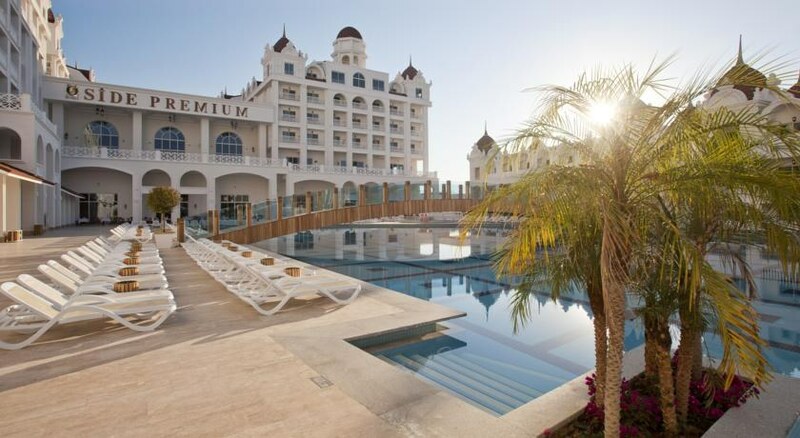 The property is just 55km from the Antalya Airport. Side Premium Hotel is just 200 m from the beach. Free on-site parking is provided. 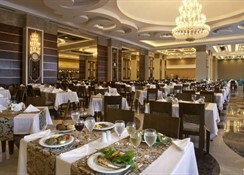 The hotel is just 65km Antalya city centre. The Antalya Airport is just 50 km from the hotel. 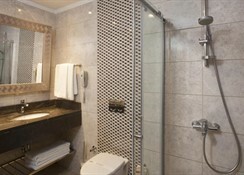 Side Premium Hotel has 476 rooms designed in contemporary style and modern architecture. 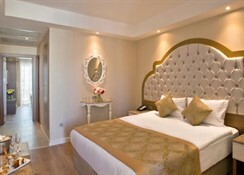 Spacious rooms of 25 square metres come with air-conditioning, flat-screen satellite TV, safe and a seating area. 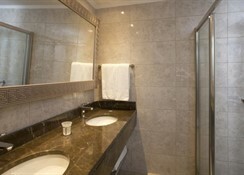 These have an en-suite bathroom shower, hairdryer and free toiletries. Side Premium Hotel has master chefs prepared with meticulous care and the freshest of ingredients. There is an array of Turkish, Italian, Greek, Far Eastern and international cuisine at the a la carte restaurants on offer. Additionally, there is the main buffet restaurant. 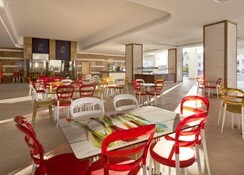 Guests can also relax at the clutch of bars, pool bar, beach bar, lobby bar, jazz bar, snack bar, lounge and patisserie. Side Premium Hotel has a Spa and Wellness Center sprawling over an area of 2000 square meters. Guests can relax with an authentic and rejuvenating massage. There is a Wizard of Oz Kid’s Kingdom, designed for the tiny tots and safe play areas looked after by attentive animation staff. There are facilities for darts, table tennis and billiards, and a games room. Baby-sitting facilities are available on request. There is a mini-market and gift shops where guests can shop for souvenirs. food not very good, but the lovely staff made up for it.